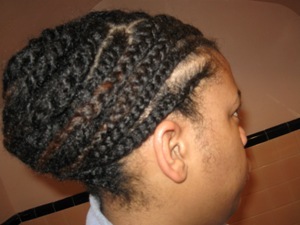 African-American Braiding Styles that Work! 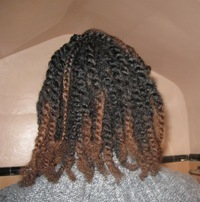 Instead of twisting my hair, I braided 10-15 sections in order to stretch my detangled hair to loosen my tight curls. After washing the conditioner out, instead of not putting any product on my hair, I put oil, Wave Nouveau Finishing Lotion, and Infusium 23 (especially concentrating on my ends). 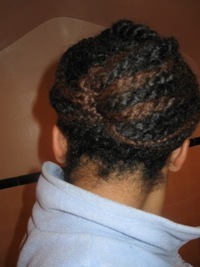 Then, I air dried my hair and took out the braids the next day. 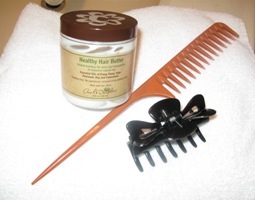 With the skinny part of the rat-tail comb, I parted my hair in two sections, the back and the front. I clipped the back section. In the front section, I made a large diagonal part from the back to the front (see picture) and clipped one side and cornrowed the other side. 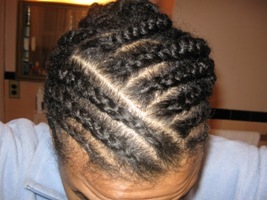 On the right side I made 4 cornrow braids using diagonal parts. 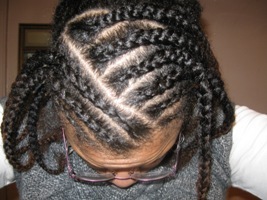 On the left side, I made 6 cornrow braids also following the same pattern. Step 2: Then I twisted the back section. I used about 1/2 inch-1 inch parts for each one. 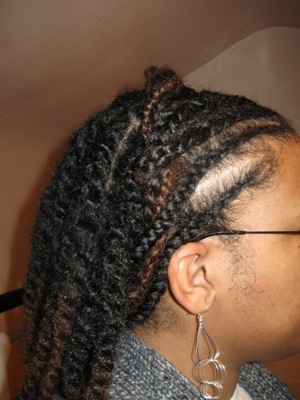 In addition to African-American braiding styles, natural hair can do so much more. Click here for more style ideas.